Plant lifespan. Even perennial grasses have a lifespan. As a selling point, a blurb in a seed catalog may mention that a particular variety doesn't need to be reseeded for so many years. Usage. The best quality hay is cut before it goes to seed. Some farmers plow and plant for hay annually. Natural changes. Permaculturists will mention succession, the ecological concept which describes the changes in any given landscape over the years. This is very observable as new plants (often designated "weeds") spring up frequently, while other plants disappear. Livestock. Adding livestock such as goats will change the equation too. Goats will eat down what they love so that it cannot perpetuate itself. This is why rotational grazing is important, which points to having enough fenced areas to allow browse areas to rest, as well as knowing how many animals our land can support. 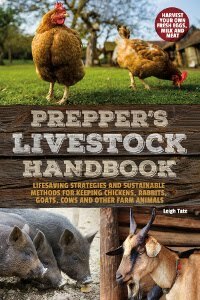 For homesteaders like Dan and me, the question of fitting a self-sustaining pasture into our overall goal of self-sufficiency is an important one. It means not only grazing and foraging for our critters, but hay as well. Having to buy tons of hay or hundreds of pounds of pasture and forage seed every several years doesn't suit, but then, trying to collect and save that much seed doesn't either! Toward that end I've done some experimenting. For example, I've tried to let wheat reseed itself (see the entry for "winter wheat" in my June 2012 "Around The Homestead" post), and I've tried spot seeding bare areas with annual rye seed last fall (see "Winter Pasture"). While I was mucking out the goat shed the other day I had another idea. Usually the barn cleanings go to making compost piles. This is great for the garden, but I also end up with things growing from seeds that didn't decompose. As I was dumping the wheelbarrow, I wondered why I couldn't just spread it over an area in the pasture. 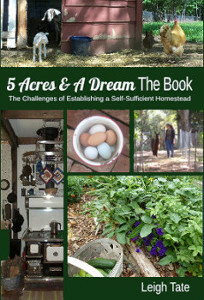 It would add manure and, perhaps, the seeds from the hay would sprout and grow in a place we wanted them to. still remains at right. The buck barn is in the background. Because seeds need to contact soil to grow, I rake back the leaves before spreading the hay and manure. When the wheelbarrow is empty, I rake up the leaves and use them as mulch in the garden. Three Speckled Sussex hens looking for goodies to eat. Of course, the chickens think this is all very grand. As soon as they see me spreading, they come running and happily scratch around. Because of that I wonder if anything will grow at all. The chickens may very well find and eat all the grass seeds I'm hoping will sprout. I have to remind myself that even if they do the land will benefit from the manure and wasted hay, which will add organic matter. And of course the chicken will benefit from having something to eat. There is no waste, no matter the outcome. In a couple of months I will spot seed the bare places in all our pastures. I will use boughten seed, but I will still ponder how to maintain it with the means available on our own homestead. As with everything we do, it's trial and error, research, and try again. It's all one step at a time. Two Soil Tests, A Comparison (the differences between a test from the cooperative extension service and a private soil testing service). When I go out in the world, I deadhead for people. My pockets are forever filling up with seed heads and loose seeds. It is then gleefully flung to the bare earth prior to the barn toppings. This is my first home manure project. I am opposed to extra work. Picking it up and putting it down is enough. No digging, thank you. Besides, I have an ice crust ten inches thick on my wood chip pile. I can't imagine trying to get the soil open. It is an ongoing challenge for us too. We are thinking of establishing a strong summer active pastur and use no-till seeding to plant winter active species. Hoping that cell grazing and compost tea will keep growing as I detest the idea of regular reseeding! Barb, great minds think alike! The other day I saw seed balls (I think that's what they're called) and then saw a how to make them on a site when I was researching permaculture pasture. Don't have a clue as to how well they work. Liz, I've about decided this is going to be an ongoing challenge. This spring we plan to get a couple of pigs for natural tillage. They'll be butchered in the fall. I'll have that soil tested and them plant to pasture. At least that's the plan. If the pigs can root out weeds and expose the soil, plus fertilize, I'm hoping this will be an easier way to do regular pasture maintenance. It will be interesting to see how it works out. I'm currently researching a crop for our very moist meadow. Something that likes a lot of water and will overwinter. I'm learning a lot which is always a good thing. No doubt we have a period of trial and error ahead of us. I hope your plan works, I'll keep my fingers crossed. I know with cows its easier to do cell grazing on site, so the manure is dropped in the pasture and all the farmer has to do is move the cell fencing. But goats are another matter, aren't they? Goats love to test fencing, and you'd need quite a few of them to drop manure in the pasture to justify the cost of purchasing electric cell fencing. You've stumbled across a solution you were already use though. Never hurts to experiment, I say. Deep littler is gorgeous stuff. I'm looking forward to seeing how the pasture develops over the next growing season. Susan, I think the thing that makes sustainability such a challenge is that there are no one-size-fits-all answers. For all the excellent resources out there, in the end it all boils down to personal trial and error because of all the personal variables. That's why I love blogging, however. I learn so much from others' successes and "failures" (although if someone learns something, it's not a true failure). Chris, George Washington used to do that with his sheep at Mount Vernon. It's true, however, that goats are a bit different. Still, we are planning to one day purchase some electric netting to help focus either foraging or growing. Ever since we spotted coyotes we've been locking the goats in at night which means all the more muck! An odd thing to be happy about but I know you all can relate, LOL. I've been going back & forth on what to do with ALL that goat-wasted hay. On one hand I want to compost it for garden amendments, on the other hand, I know it would do well in the bare spots in the pasture for reasons you have stated. So it all depends on my mood. Regardless, it doesn't get wasted. First it's goat food, then it's bedding, then it's either compost or pasture "seeding". I also love Farmer Barb's idea about deadhead collecting - brilliant! I'm totally going to start doing that!! We do the rotational grazing thing with our beef cattle in the summer. This time of year,we bring out bales into the pasture that had the least amount of good grasses last year. We move the bale ring each time we bring a bale. In the spring there'll be a nice layer of hay and manure over this pasture and we'll gate it off for the summer. The good grasses come up lush. The weeds -not so much. Intensive grazing also works this way. The cattle are moved every day and the pasture grasses are trampled into the soil and not eaten down to the ground. Goats are a bigger challenge. I was thinking of trying electric netting to move mine from place to place. So nice to have found your site. Carolyn, you're hitting the nail on the head. No waste is the ultimate goal! Jaime, it's just wonderful to have enough to spread! And I agree about Barb's idea. I do that for herbs mostly, and plant them around the pastures for the goats and chickens too. Odiie, hello and welcome! Thank you for that tidbit, it confirms what we're trying to do. At the moment we're working on small paddocks of 1/4 to 1/2 acre each for rotating the goats. We aren't there yet, but that's the goal.